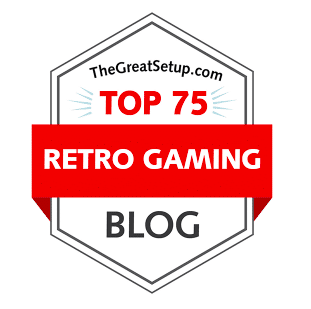 Retro Gamer Randomness: Best Controller for Shoot'em Ups: Stick or D-pad? Best Controller for Shoot'em Ups: Stick or D-pad? If you have poked around on this blog at all, you may notice that many of my posts are based on shoot'em ups. 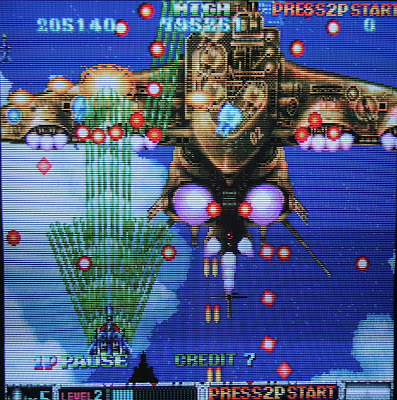 Systems like the Saturn, Genesis, PC-Engine, and Dreamcast most notably come to mind when tallying the vast riches of shoot'em ups. This post is not about is not what system reigns, or which games are the best; I wanted to discuss the type of controller that I use for shoot'em ups. It should be noted that the genre of shoot'em ups has sub-generes, including but not limited to: traditional side-scrolling, traditional vertical scrolling, bullet hell, Euro shmup, On-rails, run'n gun, cute'em ups, isometric, and others. Depending on the type of gameplay, the preferred control scheme may change. 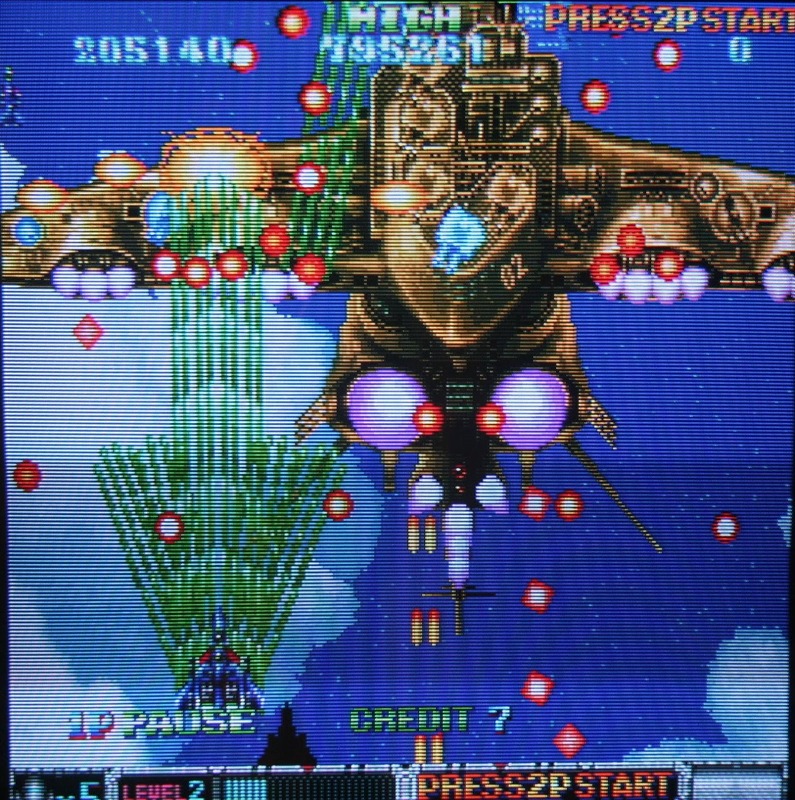 Older (traditional) shoot'em ups are generally slower-paced. Emphasis is placed on navigating environmental hazards as well as enemy fire and flying enemies themselves. Respawning after death occurs at checkpoints, often woefully underpowered. Memorization and reflexes are requisite skills here. Examples include Gradius, R-Type, Aleste, Darius, Star Soldier, Thunder Force, and others. Modern shoot'em ups tend to be of the bullet-hell variety, where hundreds of bullets are spewed across the screen, and you have to navigate the slim pockets of empty space between them to survive. The hitboxes of your avatar are generously small, as you will need all the help you can get. With so many bullets on screen at once, the key to survival is small movements, taps at a time. It is hard to enjoy the backrgound scenery (which is usually gorgeous) as you cannot take your eyes off of your craft. I have played all types of shooters with both a standard d-pad and an arcade stick. The arcade stick presents better aesthetically. Larger buttons, a firm grip on the joystick, and solid base all recall (or simulate) the nostalgic arcade experience. However, I find that my performance lacks when using one; I never seem to get as far in the game with the arcade stick. The total gross movement necessary to initiate movement is exaggerated on a joystick, and less subtle, almost to the point where there is wasted motion. This of course is subject to the quality of the joystick, and more specifically, the dead zone. The dead zone is the physical range in which the stick moves but does not register a movement. This is easy to notice on a stick that has microswitches, as you would hear the click as you move the stick. A good stick will have as small of a dead zone as possible. There is a lot of truth in the old adage: "you get what you pay for". Oddly enough, While the microswitches are associated with higher quality control, the actual sound of the clicking mildly annoys me. I feel that a controller should not be noisy, it detracts from the experience. I do have a few high quality sticks, and even still, I am able to more accurately navigate with a good directional pad, and can respond more quickly. I modded my DC stick with Sanwa parts. I even scuffed it between the buttons with the dremmel for "character". Just like anything else, not all d-pads are created equally. This is very much a "feel", and everyone will have their own preferences. 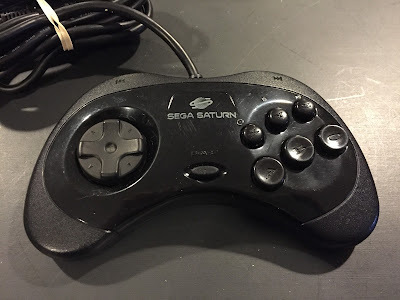 My favorite d-pads are: Saturn (model 2), Genesis (6-buton), and SNES. The Saturn pad has the perfect amount of range and cushiony resistance, and due to its circular base, all directions are equally and easily pressed. The Genesis 6-button has a very similar d-pad, so similar that it might be the same. The SNES pad has a cross base, much like the NES, yet is easier on the thumb than the NES d-pad. I don't like it quite as much as the diagonals are not as easy to press on a cross pad when compared to a circular based pad. I wish the PC-Engine controller had a better d-pad. It's ok, but its a tad smaller than the average d-pad and not as comfortable as the others mentioned. Since we're on the topic of shoot'em up controls, I feel I must mention my disappointment in the Dreamcast controller, both the d-pad and the analog stick. The d-pad is raised fairly high above the controller base, and has sharper angles in its mold, making for painful use. The analog stick is plastic as well, and a bit slippery. There are texture bumps on the top, but they generally wear down quickly, so any controller used for an average amount of play has been worn down to a shine. For a system with a wealth of shoot'em ups, this is a major letdown. Luckily, the Total Control 3 adapter lets you use Saturn controllers for the Dreamcast. The Ascii Arcade Stick is quite good as well. Another letdown is the Playstation (1,2,3) d-pad. Instead of a circular or cross base, there are 4 directional "bumps" that attempt to simulate a d-pad. This design is perhaps worse than that of Dreamcast. The amount of pressure needed to navigate diagonals is uncomfortably high, and blisters set in rather quickly. The Playstation 1 and 2 have a decent amount of quality shoot'em ups, so this is potentially a problem. There are a few arcade sticks available, and some third-party controllers to choose from. I was lucky enough to stumble upon what I consider the holy grail of PS1/2 shooter controllers: the official Sega Logistical Services Saturn pad for Playstation. It is a genuine Sega Saturn controller, made specifically for Playstation. These are kinda rare, yet so worth it. In conclusion, I feel that using a stick is better experience on shoot'em ups, but d-pads allow for better performance. If I was to truly attempt to beat a game, I'd have to go with a d-pad. Everyone is different, this is just where I am at. I'm curious to see what others think on the matter. I should mention that I use a lot of these sticks for 2D fighting games. I find I need the sticks for those types of games far more than I need them for shooters...but that's another story for another time. Saturn controls for the Dreamcast, anyone?